There are some Sundays, when the readings we are treated to are just so rich and so packed it's difficult to know where to start. And today, Corpus Christi is just such a day. We have just heard in Luke's Gospel about the feeding of the 5000. A miracle so important it is the only miracle performed by Jesus that is told in all four Gospels. From the old testament we heard in both the reading and the Psalm about Malchizedek, and from the New Testament in Paul's letter we heard about the last supper and the institution of the Eucharist. In fact as Paul's letter to the Corinthians is one of the earliest written, and was written well before the Gospels, so we have in today's reading the earliest quotation of Jesus in the bible “This is my body, which is for you; do this as a memorial of me”. And I think this line, which we hear in every mass during the consecration is where we should start. We all know the meaning of the word memorial or memory. If you looked it up in a dictionary it would say something like “The power of retaining and recalling past experience”. We can all remember things, particularly special things, your first school, your first kiss, your wedding day, your ordination day. And something as special as the first Eucharist must be remembered, but memory or memorial is not what Paul wrote, it's how it has been translated for us into English. What Paul wrote is even more special than memory, and I am going to have to try and teach you a little Greek to explain. Paul used the word “Anamnesis” it's a Greek word first used by Plato. If you look it up in a dictionary or on the web you get pages of explanation and a lot of ancient Greek, which is not easy to understand. So before we get to the Greek we are going to start with something a little simpler, Lewis Caroll and Alice through the Looking Glass. Where there is a conversation between Alice and the White Queen, in which we get a excellent example of Anamnesis. `It's a poor sort of memory that only works backwards,' the Queen remarked. Anamnesis, is a bit like the Queens memory, it works both ways. Coming back to Ancient Greek & Plato, the definition is something like this: There are thing you know, that you have always known, that are true and have been and will be true for all eternity, the problem is you can't remember them. A good teacher can help you remember these eternal truths. And this remembering an eternal truth that you didn't think you knew is anamnesis. So in a few minutes time as we witness bread and wine becoming the body and blood of our Lord Jesus Christ, we are not watching a re-enactment of the last supper with Fr. Frank pretending to be Jesus. We are actually there. Fr. Frank, in Persona Christi, is actually Jesus and we all stand with the disciples at the last supper ready to receive our Lords body and blood. We are also at the foot of the cross, watching His sacrifice, as He gives Himself for us all. And we are with him, in heaven, at the end of time when he welcomes us to his banquet. All these things are known, are experienced, are remembered from across time, because they are eternal truths. If we think about this moment of anamnesis, the last supper and Jesus' death upon the cross, we see Jesus in two roles. First as the priest at the last supper taking the bread and wine and giving thanks for them, and also as the priest during his passion, as he offers his life for us. It isn't taken from him but offered as a once and for all sacrifice for us. We also see Jesus in both events as the sacrifice, in the place of the passover lamb, His life offered to God the father for our sins. On the cross we see His life offered up and in the last supper, our Eucharist, we see it offered to us. This twin role of Priest and sacrifice can be difficult for us to understand, but it was almost impossible for the early Christian theologians to understand. The problem was Jesus was from the line of David, and therefore from the line of Kings, so He could be accepted easily as King of the Jews. But he wasn't from the line of Aaron, the tribe of Levi, and therefore was not a priest. If he wasn't a priest how could he offer sacrifice to God. And this is why Malchizedek is important today. Malchizedek lived at the time of Abraham, before the Isaac, before Jacob, before the founding of the twelve tribes and before God through Moses gave the priestly duties to Aaron and the tribe of Levi. Malchizedek as we heard today, was both King of Salem, the original name for Jerusalem and a Priest of God Most High. So as today's Psalm tells us Jesus was “a priest for ever, a priest like Malchizedek of old”, and therefore able to offer His sacrifice for us. Finally, I would like to turn to the gospel, and you can relax a little, no more Greek and no more deep theology. Just a simple message Jesus taught the disciples and one we have the privilege of learning from today. Jesus has just spent the afternoon with a huge crowd of people, healing and teaching them. As the disciples realised it was going to start getting dark, they also realised the people were going to start getting hungry. They didn't believe they had enough food to help, so they asked Jesus to send the crowd away, if we are being a little harsh here, they were hoping the problem could be given to someone else. Then Jesus shows them, that no matter how small what they have to offer is, when offered to the service of God, it can be used to solve huge problems. Five rolls and two small fish are used to feed 5000 people. We all have gifts, and even if we think they are small and of little value, if we offer these gifts to God, what would he do with them. The thing is to find out we first have to offer them. I did say at the start, that our readings today were particularly packed and rich. 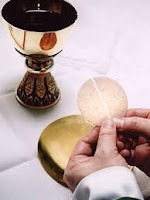 I hope they will add some richness to your experience of they Eucharist and some challenge to your Christian life. In a few minutes, we will stand in the presence of our Lord, His body and blood, offered for us. When we leave mass tonight we take that gift, the source of our Christian strength with us. What are we going to use it for this next week, what gifts are we going to offer and what will God do with them.